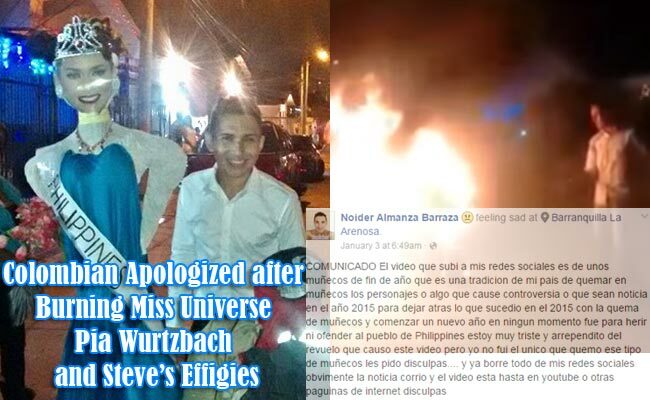 Last New Year's eve, a Colombian national named Noider Almanza Barraza received tons of hate from the Filipino community for burning the effigies of the reigning Miss Universe Pia Alonso Wurtzbach and the pageant's host, Steve Harvey. But on January 3rd Barraza posted his apologies on his Facebook account. He explained that the videos of him burning effigies of multiple personalities were actually a tradition in their country and was a sign of moving forward to the next year. He then apologized to the Filipinos who were offended by the act and revealed that he was sad that it was taken against him. He mentioned that he was not the only one who performed this Colombian tradition.On his last post, Barraza asked for forgiveness. He even had deleted his photos and videos of the effigies burning and set his Instagram account to private. Last January 2, Barraza’s video along with his fellow Colombians burning the effigies of Harvey and Wurtzbach became viral that angered many Filipinos, calling the Colombians “bitter”. The coronation of Miss Universe 2015 became controversial when Harvey announced Miss Colombia Ariadna Gutierrez Arevalo as the winner of the pageant when, in fact, it was Miss Philippines Pia Alonso Wurtzbach who really won. Right there and then, Harvey apologized to the crowd and solely took responsibility of his huge mistake. He also apologized to Wurtzbach personally at the press conference right after the pageant. Despite the error, Harvey was still invited by the Miss Universe Organization to host the pageant next year. Barraza along with other Latin – Americans burned the effigies of Steve and Pia on New Year’s Eve and then posted it on their social media accounts. This tradition is called Ano Viejo or Old Year in most of the Latin – American countries performed on New Year’s Eve. They burned effigies of the controversial personalities of the previous year by midnight.